I am really excited to announce this latest addition to the bookstore. Excited because it’s a project that my wife, Jennifer and I worked on together. 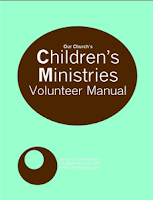 It’s our Children’s Ministries Volunteer Manual. It’s the very manual that we developed and used in our own children’s ministries department – and now we’re making it available to you. It’s a great resource for those of you who need to develop a manual of policies, procedures and resources for your children’s ministry leaders. Just take the ideas and adapt them. You can get it in the bookstore. My beautiful wife did the layout/design and helped with the editing. Kids are your target – so get into their minds and let them into yours. Believe it or not, kids are the most creative of God’s creation. Their imagination is amazing… crazy amazing! Give a kid a toy and in 10 minuets, it becomes something else than what it was designed for. My son can take any object and turn it into a gun, sword, or some ninja thing. My daughter can take any toy or object, and rock it to sleep. So get with them. Just give them a chance to be heard. Gather together the kids in your church in age appropriate groups and buy them lots of pizza and ask them questions. I like to hand out paper and let kids take simple polls. I ask about favorite music, movies, shows, hobbies, sports, etc. It will give you a look into their world and sometimes, gives you some insight as to what’s going on at home… (I’ll let you think about that one). It may cause you to shelve your current curriculum to focus on a subject or topic that’s relevant to your kids… NOW. Brainstorming is a great way for your older elementary kids to get in on the planning in your CM. Get your 3, 4 & 5 graders together and present some ideas – then, let them voice their opinions. Write those ideas down. Here’s an important note: take each one idea seriously and consider it. Get down to getting their reactions to some of your ideas for events, lesson topics and design. Remember the silly-putty exercise – do it! Or hand out other props related to your research and allow them to play and come up with games and fun things to do with them. Have thick skin… in other words: don’t be offended by their ideas – they are telling you what they think is cool and what are good ideas in their minds. This is not about you – if they like your ideas, they will tell you… and, if they hate it – they will pop your bubble! But, your goal is not to sell them your ideas, it’s to get into their minds. You may come up with the most innovative program, ministry or event just because you listened. Don’t let the concept of “other people” be foreign in your process of being creative and developing ideas. Some of the greatest inventions and ideas in the world wee created by a team of two or more. I don’t care who you are… what your level of experience is… where you’re going… how you got to where you are today… or what you think of yourself – I can guarantee you this: If you and, at least one other person, sat down to brainstorm together, you would come up with some incredible plans, ideas and creations! You know others on your staff, on your team and in your congregation who are creative and artistic… you know those who are planners, thinkers and dreamers. Take you idea to them and run it past them and get their initial reactions. They will not only respond – they feed off of such an approach. Pull these people into your life and onto your creative team. Sit down right now and make a list of people that you know you could “run and idea past”. Get the church directory or look it up on your church’s database – scroll and take note. Don’t just use these folks. They may not have much experience with children’s ministry, but they would love to be part of a creative group. Perhaps you need some folks on a sermon planning team that could help you come up with ways to illustrate the message – or a design team to help you with publications.